Dear Egyptian readers: yes, we know you're out there. We're sorry to report that Google Street View still isn't available for the vast majority of your country. And while you'd surely prefer Street View in Cairo or Alexandria for the sake of convenience, at least Google has made a small stop in Egypt... at the place where all the other Americans go first, the Giza Necropolis. Street View is now available in and around the pyramid complex. 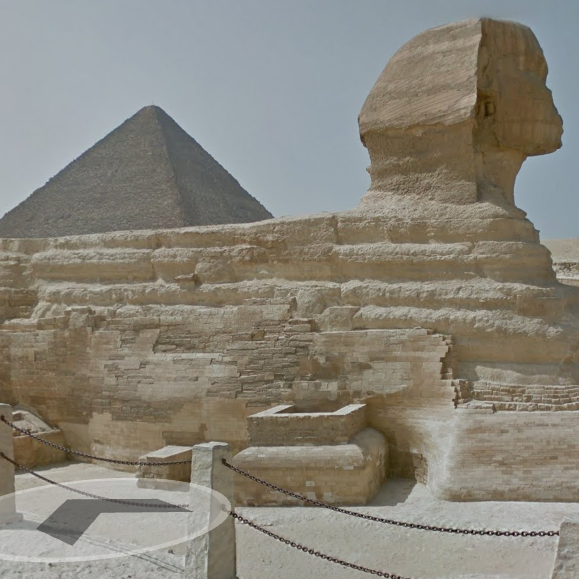 Google has taken its trademark Street View rigs around the Great Pyramid, the Pyramids of Khafre and Menkaure, the Great Sphinx, and the various smaller pyramids, tombs, and monuments that still stand in the area. By the way, that bit about camels in the headline isn't just me being culturally insensitive: on a typical day like the one Google visited, camels and donkey carts share the Giza roads with modern sedans and tour busses. "Photo tours" are available for quick highlights of the various notable landmarks, and all of it is accessible from Google Maps on the web or Android. The Pyramids of Giza are some of the best-documented archaeological sites on the planet, but Street View helps give them a little perspective in the modern world. Head to one of the outskirts of the pyramid complex and you'll see that they sit not in the middle of a barren and unassailable wilderness, but on the edge of the enormous Cairo metropolis, a stone's throw away from modern residential and manufacturing areas. Which, to be clear, still don't have Street View themselves.